Deal of the Day – Trailer Life Magazine is just $4.19 for 1 Year at Best Deal Magazines, September 16th Only – A Retail Value of $59.88 – with Coupon Code 160916. 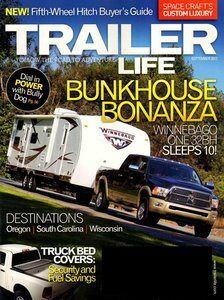 Trailer Life magazine is written specifically for people whose overall lifestyle is based on travel and recreation in their RV. Every issue includes product tests, travel articles, and other features- ranging from cooking tips to vehicle maintenance.